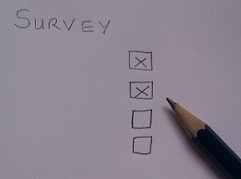 The Database Management Survey is open and available to complete at http://svy.mk/UcaxDm . I am currently undertaking a PhD with the Open University and my research investigates the current practices and procedures that are used in database management and examines the complexities of managing database systems. The Database Management Survey is for database administrators, data professionals etc to complete for every database engine. It is a comprehensive survey that covers the end to end lifecycle for managing database systems across on premises, cloud, differing database engines, virtualization and big data etc. The survey will take about 15 minutes to complete and I would be most grateful if you could complete as many questions as possible. Many thanks for your help with the Database Management Survey 2013 and Merry Christmas. I am a senior certified Microsoft Certified IT Professional (MCITP) Database Administrator who is examining how management of database systems can be improved for the database community, as part of my PhD study with The Open University. To proceed I need your help and the help of as many people as possible in the industry. 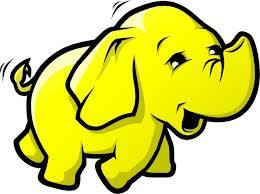 We see a lot of discussion about new database engines, tools, features, the cloud, big data etc. but how do we administer and manage this ubiquitous landscape? I need to know to what extent practices and procedures are utilised by the database community and what affects their adoption. Please help me with my research by completing this survey. It will take 15-20 minutes of your time and it is an in depth survey. There are no prizes for helping, just the satisfaction that you have helped the database community as a whole and of course my gratitude. Thank you very much for agreeing to participate in this survey. To view the Code of Practice for the Research click here. 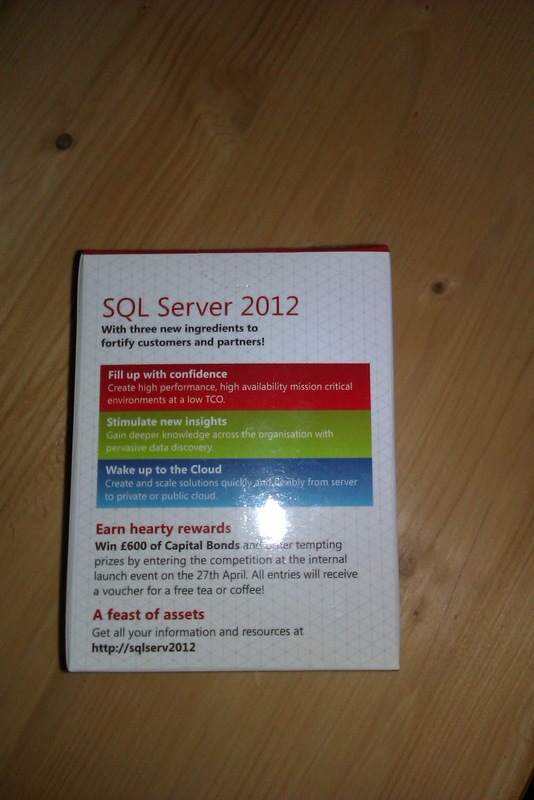 SQL Saturday http://www.sqlsaturday.com/ comes to Exeter in 2013. This event will be held on 8th and 9th March 2013 at Jurys Inn Hotel Exeter. Mladen Prajdić - From SQL Traces to Extended Events - The next big switch. The term BI Semanitc model has been bounded around a lot over the last year. I have come across a few really good articles which explain this in more depth. The definition is that the BI Semantic Model is one model for all end user experiences. Here are my a few of articles that clearly explain this term with a really helpful diagram. So, what is the BI Semantic Model? The SQLBits Committee announced the dates of the next SQLBits conference. SQLBits XI will be taking place on May 2nd-4th 2013 at the East Midlands Conference Centre in Nottingham, UK. 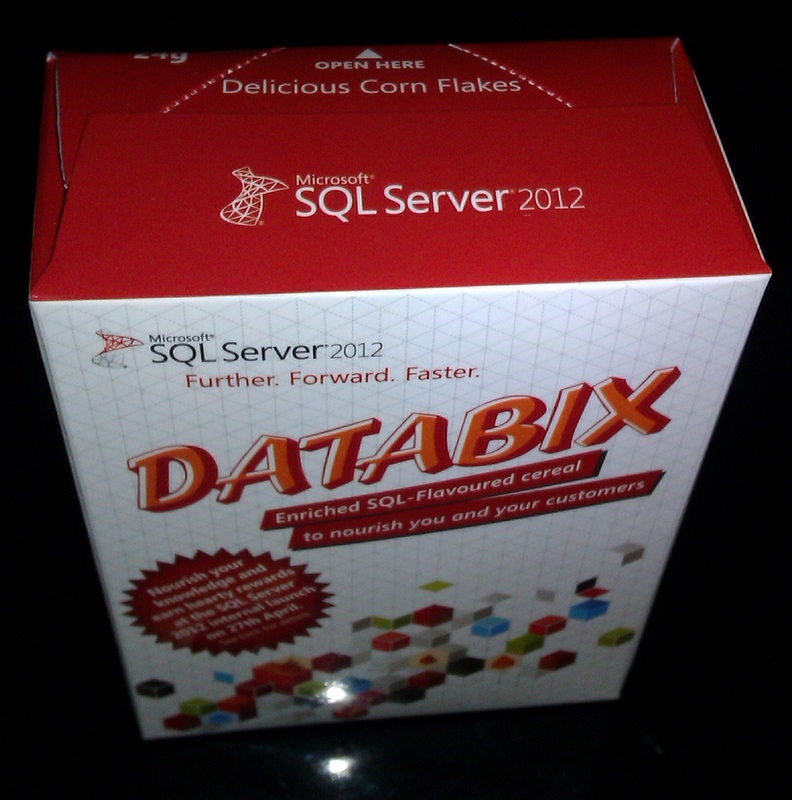 More details will be here http://www.sqlbits.com/ over the next few weeks. This session was very interesting and shared the technical workings of Polybase. It was delivered by David DeWitt, Director at Microsoft from work in the Gray Systems Lab http://gsl.azurewebsites.net/Projects.aspx . He set the scene explaining the Hadoop ecosystem. Then defined the main components. This is a two universe world of both structured and unstructured data. The 2 alternative solutions are Sqoop which has limitations and Polybase which is a superior alternative. 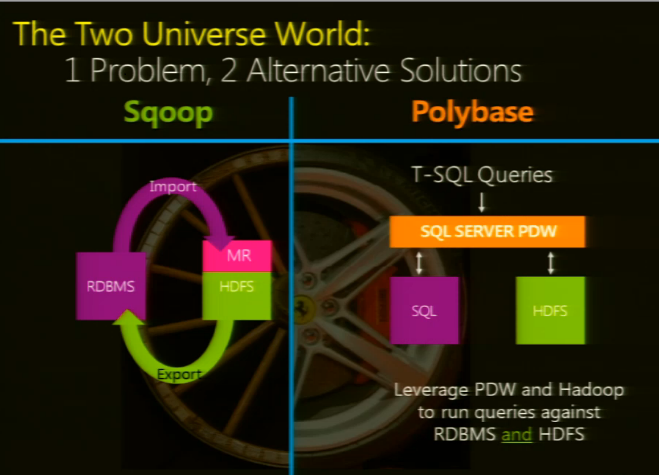 As stated on the Gray Systems Lab site "the goal of the Polybase project is to allow SQL Server PDW users to execute queries against data stored in Hadoop, specifically the Hadoop distributed file system (HDFS). 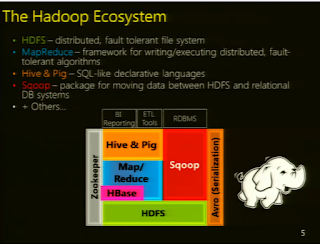 Polybase is agnostic on both the type of the Hadoop cluster (Linux or Windows)"
The sessions discussed the approach and drawbacks of each method. There are several phases of delivery planned. Polybase for PDW is a first step. The second PASS summit keynote was delivered by Quentin Clark, Corporate Vice President, Data Platform Group. The keynote took a journey through the data lifecycle. The data lifecycle being broken down into 5 areas. The lifecycle starts with managing all the data. Combining any data wherever it lives, be it relational and non-relational, cloud & on-premises and model architecture. Then from that data finding all the relevant information and ways to unlock the value of the data with models and analysis. After which creating visualizations of the data and allowing collaboration on the data. The data requires governance and control, transforming insights into repeatable business process. Self service is the key element being delivered by the new tools. The demos showed many of the available tools including Data Explorer http://www.microsoft.com/en-us/sqlazurelabs/labs/dataexplorer.aspx and how AlwaysOn allows you to add Azure as an availability Replica in SSMS which adds scalability. The session ended with the message that Microsoft are providing a complete platform solution to let you find what the data is trying to say and embracing the new value of data. The next couple of sessions were very useful, exploring under the hood with the sessions using statistics and relational algebra. The sessions were Optimizing column stores with statistical analysis by Thomas Kejser and the SQL Server 2012 Query Optimiser by Conor Cunningham. The last 2 sessions I attended covered Windows 2012 Infrastructure for SQL Server and Cloud Ready Data Services. 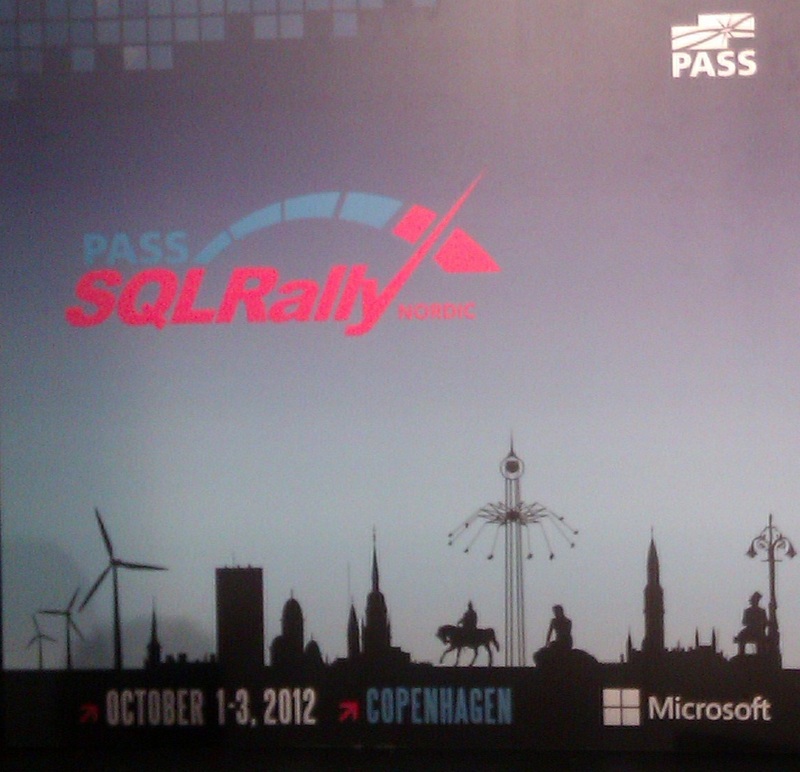 All in all an excellent conference with great sessions and lots of exchanging SQL views with like-minded people. The main conference started with a keynote delivered by Kamal Hathi BI on Big Data. 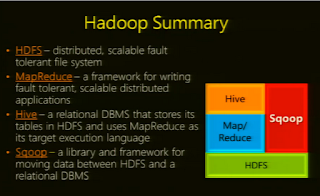 This started with a historical look at database\ data progression. With social and web analytics and live data fields, how do we predict future outcomes? Utilising advanced analytics on big data this can be visually displayed with the creation of a storyboard connecting the many data sets such as SQL Server, Hadoop, Excel etc. with the Microsoft toolset. There is no one single tool but a collection of tools for the job. 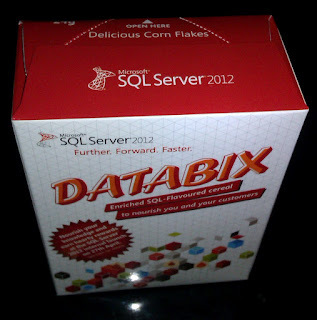 Other sessions I attended were from the DBA track which covered extended events, clustering and memory management for SQL Server 2012. 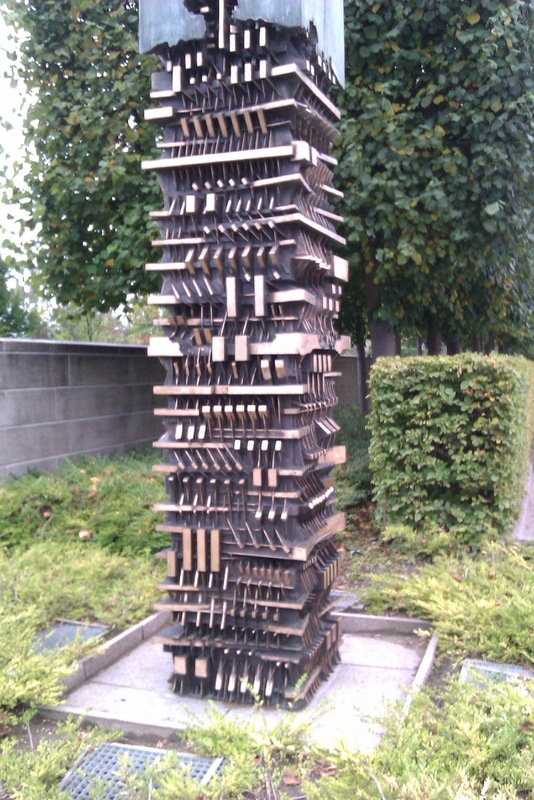 The key to a successful cloud, distributed computing system, is all in the architectural design. A phase from the session “Telemetry is Life” left me thinking about patterns and practices. The end of another great day. 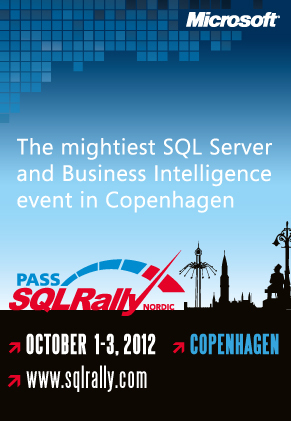 The PASS SQL Rally Nordic from October 1-3 2012 in Copenhagen started with 3 pre-conference seminars. I attended a session covering the Microsoft Business Intelligence (BI) Presentation layer taken by Stacia Misner. This excellent session covered the theory of the BI Maturity Model from TDWI by Wayne Eckerson, a roadmap to analytical completion and collaborative decision making. Then this was mapped to the BI stack of SharePoint, SQL Server Reporting Services, PowerView, PowerPivot, Performance Point and Excel. The Data Scientist role is an interesting evolution in the BI and Data Mining filed. This role is the new name for a quant and an e-branding of statistical literacy as "data science". There are a few interesting quotes I have seen in the last few weeks defining data scientists which I thought were worth sharing. An article in computing http://www.computing.co.uk/ctg/analysis/2201583/computing-research-the-power-of-data-science explained the difference between the BI specialist and Data Scientist. Came across these excellant 2 diagrams from 2 very interesting blog posts. This diagram shows where all the main database engines fit into the wider data management landscape. Taken from http://xeround.com/blog/2011/04/newsql-cloud-database-as-a-service although the original article NoSQL, NewSQL and Beyond: The answer to SPRAINed relational databases is by Matthew Aslett which is part of the The 451 Group’s new long format report on emerging database alternatives, NoSQL, NewSQL and Beyond. 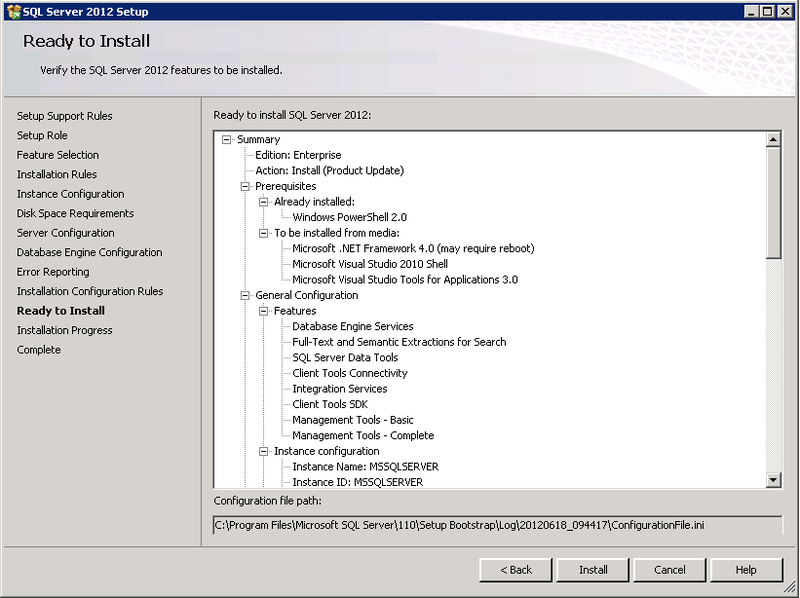 Automating a SQL Server installation for unattended installation creates a consistent deliverable for a SQL Server build. The configuration file will need additional configuration details for unattended use as sensitive information is not included. IACCEPTSQLSERVERLICENSETERMS is required to acknowledge acceptance of the license terms. The QUIET and QUIETSIMPLE settings are required to allow the Setup to display progress only, without any user interaction. A few parameter may need updating between server builds. Setup.exe /SQLSVCPASSWORD="************" /AGTSVCPASSWORD="************" /ISSVCPASSWORD="************" /SAPWD="************"
SAPWD: Specifies the password for the SQL Server sa account. There are 3 parts to the deployment process. Run the run installer. The dashboard automatic install path places the files in C:\Program Files (x86)\Microsoft SQL Server\110\Tools\Performance Dashboard. 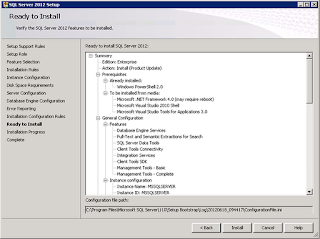 In the Performance Dashboard folder execute the setup.sql script. Test the deployment by opening a report. Open the report by selecting the server instance in SQL Server Maangement Studio (SSMS) and in the menu options select Reports, then; Custom reports and navigate to the install path C:\Program Files\Microsoft SQL Server\110\Tools\Performance Dashboard. Then select performance_dashboard_main.rdl and Click open and select Run. To explore cutting edge ideas in the database world. 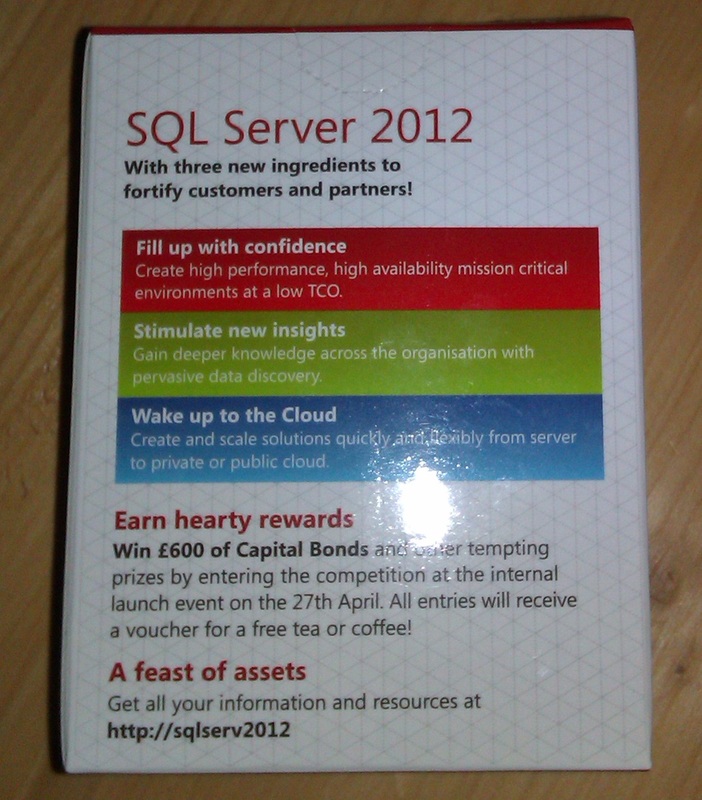 I attended SQL Relay 2012 in Clifton, Bristol yesterday which brought together SQL experts from the southwest. The location was fantastic at the Avon Gorge Hotel which overlooks Brunel’s suspension bridge. The al fresco dining for lunch in the glorious Sun added to the interesting SQL discussions. There were overview sessions from Microsoft in the morning on SQL Server 2012 and Deep Dive sessions in the afternoon from SQL Server MVP's. The morning sessions delivered by Microsoft by Morris Novello, SQL Server Product Manager and Andrew Fryer, Technical Evangelist discussed the explosion of data volumes, new innovations in the cloud and new development features within SQL Server 2012. The practical overview of SQL Server 2012 new features showed the breadth and depth of the changes to the product which will take SQL Server to a new level. The afternoon MVP’s Tony Rogerson covered SANless high availability with Always On and Martin Bell covered Distributed Replay. Considering disk geometry added an interesting dimension to Always On and being able to mitigate risk against hardware consolidation and changes using distributed replay was insightful. Rapid Deployment and Use reference configurations optimized for data warehousing. Highly tuned solution that integrates hardware and software. Parallel processing (MPP) architecture to gain scalable performance, flexibility, and hardware choices with the most comprehensive data warehouse solution available. With three new ingredients to fortify customers and partners! The volume of free training available for SQL Server in the cloud is continually increasing. The best sites I have found are below. This allows you to evaluate and test Microsoft's products and technologies with a series of hands-on labs that you can complete in 90 minutes or less. This is a training portal where you can learn at your own pace, focusing on Microsoft technologies, gain points and get recognition. There are tracks in SQL Server, SQL Azure, Clustering, Business Intelligence etc. 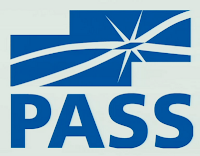 These videos are for those wanting to pursue SQL Server 2008 Microsoft Certified Master certification. Each module establishes the level of depth and breadth required to achieve this certification with deep dive subject matter included. These are good watch even if you are not thinking of taking the MCM exams. Technical White Papers provide real-world guidelines, expert tips, and guidance for SQL Server. Free PDF downloads of ebooks specializing in database and programming technologies. Excellant community conference videos of recorded sessions which are available to watch on demand. The 24 Hours of PASS event is a virtual stage of SQL Server experts with in-depth sessions on the hottest SQL Server topics over 24 consecutive (and free!) technical webcasts. The article 'Move Your Career to the Cloud with the Microsoft Certified Solutions Expert certification' sets out details of the new certification. SQLBits X, the official UK SQL Server 2012 Technical Launch Event was held from 29th - 31st March 2012 and took place at the Novotel London West, London. This was another amazing event with plenty of chance to absorb the vast array of technical offerings from all areas of Database Management, Development and Business Intelligence. It was a privilege to be a helper at such an event. The event consisted of the Training Day, Conference Day and Community Day on Saturday. In the evening there was a chance to network with the largest attendance of any SQLBits. The SQLBits keynotes were delivered by Quentin Clark , the Corporate Vice President of Microsoft SQL Server Database Systems Group and Conor Cunningham, Principal Software Architect at Microsoft. Quentin Clark showcased the vast set of new tools and new features of SQL Server 2012 to help deal with the data explosion and migration to cloud services. Conor Cunningham demonstrated the sheer speed of the new ColumnStore index and its benefits to the Data Warehouse. A great plus for the conference was the presence of the SQLCAT team and international speakers. The takeaway from the conference is that there is a change in how and what needs to be managed and where the future lies for database services. 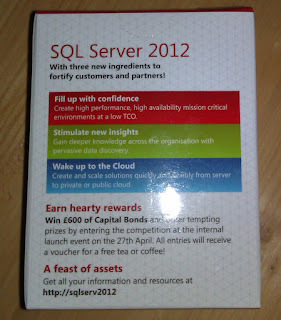 SQL Server 2012 Virtual Launch Event today March 7, 2012 starting at 8:00AM Pacific (-8:00 GMT), 4PM in the UK. Quentin Clark, Corporate Vice President, Database Systems Group. There are over 30 sessions to learn about the new capabilities of SQL Server 2012 at your own pace. Discussions held at the Avon Information Management group meeting on 1 February. My current working research questions were discussed. To what extent are best practices and procedures utilised by the database community? Is their adoption affected by the complex interactions that are an integral part of the management of Database Systems? 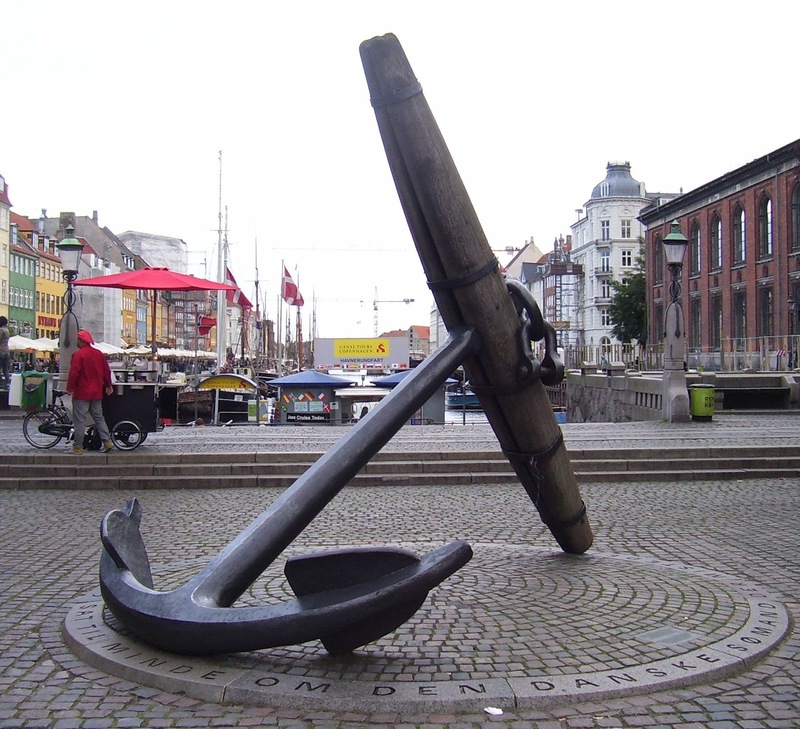 Can the use of holistic methodologies contribute to improvement and innovation? Scale up is about vertical scalability. This means increasing the capacity by adding more CPU and memory. Scale out is about horizontal scalability. This means increasing the number of servers available. Scaling up or scaling out? How wise will we become from all this additional data and knowledge? Data will rule the day and it will be provided by which ever tool meets the requirements, whether it be SQL, NoSQL, Oracle, MySQL etc.